1. Significances of the Concepts of Stability and Instability of the Dynamic Machining System. Fundamental block diagram of the dynamic machining system. Stability and instability of the dynamic machining system. 2. The Cutting Process(CP). The cutting process considered as a dynamic system. Inner and outer modulation in the dynamics of the cutting process. The cutting process considered as a: linear dynamic system; non-linear dynamic system; random dynamic system. Identification of the CP system parameters. Particular cases of CP systems. Variations of the parameters of the CP system depending on the machining conditions. 3. The Elastic Structure (ES). Particularities of machine-tool structures. Models of elastic structures. Identification of the dynamic characteristics of elastic structures. Simultaneous identification of the parameters of CP and ES systems. 4. Stability of the Time-Invariant Dynamic Machining System. Equations of the dynamic machining systems. Stability of the single-variable dynamic machining system. Stability of the multivariable dynamic machining system. Graphical method for stability analysis of the dynamic machining system. Practical stability charts. Stability of the dynamic machining system in the presence of asymmetrical chatter. 5. Stability of the Dynamic Machining System with Time-Variable Concentrated Parameters (TVP). Equations and stability of the linear time varying dynamic machining system (or varylinear DMS). The dynamic machining system with slowly varying parameters (Asymptotic stability in the turning of slender workpieces). The dynamic machining system with periodically varying parameters. 6. Stability of the Dynamic Machining System with Random Parameters or Subjected to Random Forces. Equations of the linear dynamic machining system. Stability of the linear dynamic machining system with random parameters. Stability of the dynamic machining system with random input. References. Index. 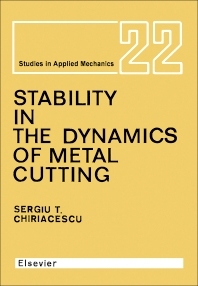 Numerous models have been proposed for the study of the dynamic behaviour of cutting tools. An analysis of the main works published over the past 20 years reveal a lack of general methodology in the mathematical modelling of the dynamic cutting process (CP) and in the elastic structure (ES), as well as the absence of efficient and general methods for identifying the conditions under which the amplitudes of the vibration chatter between tool and workpiece can become problematic. This book provides a thorough review on the mathematical modelling and stability analysis of the dynamic machining system, presenting solutions for the practical problems that can be encountered. The practical points of the stability and instability of the DMS are discussed, together with various aspects of the modelling and identification of the CP and ES systems. The latest findings are examined in the context of a general study using matrix equations. Such a study on the matrix method is timely in view of the rapid spread in the use of mini and micro-computers. Based on the matrix equations of the CP and ES systems, the general equations of the DMS with time-invariant parameters are established, and various procedures for the actual stability analysis of this system are presented. Many examples are accompanied by illustrations which also provide adequate practical instructions for other problems in the stability analysis of the DMS. The last part of the book deals with the modelling and stability analysis of the DMS with time-varying parameters, random parameters and random input. The work is addressed primarily to those interested in the design and exploitation of machine tools in both industry and research. It will also be of interest to applied mathematicians, and can be used as a reference book for advanced courses in mechanical engineering.